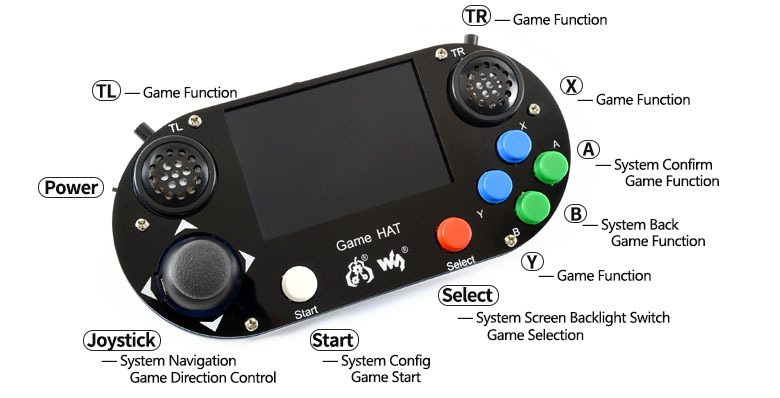 Home › Raspberry Pi › How to Use Raspberry Pi RetroPie Handle Game Console Gamepad with 3.5 inch 480 x 320 IPS Screen? console in asecond, recalls you all the gaming pleasures in the memory. Please focus on the direction of battery, if you reversely connecting the battery, the charging circuit will be damaged, so please pay attention to it when you mounting the battery. 3. Toggle the Battery switch of Game HAT to OFF, and mount 18650 battery to it. We provide image with driver pre-installed, you can download test image or you can also download original Retropie image and install driver manually. (3) Inset the ready TF card to your Raspberry Pi, toggle Battery switch to ON. - If battery is low, Raspberry Pi cannot start up. In this case, you can connect a 5V/2A power supply to Power interface of Game HAT for charging. Charge indicator will flicker when charging. You can play during charging but note that Raspberry Pi will reboot automatically if you disconnect the power supply. - If battery is full Raspberry Pi will start up normally. (4) After entering OS, you can choose emulators by joystick. For example, choose Nintendo emulator and press “A” to confirm. (5) You can see there are some games. Choose one and press “A” to enter. After cutscene, you can press “A” or “Start” key to start the game. (7) You can press the 4 buttons on the right side of Game HAT to adjust volume and brightness of LCD, Press Menu to open OSD menu, and press Up/Left or Down/Right to choose options, then press Menu to confirm option and adjust it. Finally, press Exit to exit OSD menu. Please download Retropie image on Retropie website according to the type of your Raspberry Pi. (3) After writing, copy Game HAT driver you download to root directory of the TF card. (5) Insert the TF card and a USB keyboard to Raspberry Pi, open Battery switch to power on Raspberry Pi. After booting, press F4 to open Terminal. (7) Reboot Raspberry Pi. Long press “A” button (other keys are OK as well) to enter buttons configuration page. Configure keys as below. You can also long press “A” or other buttons to pass the configuration. 1 Press “A” button to save configurations and exit. 2 Press “B” button to cancel configurations and exit without save. (8) The configuration is finished and you can try to play games now. Maybe default games in test image are not those you want, you can also add games as you like. You can download ROMS of various games there to your PC. If you like Sony Playstation games, you can choose. current IP address of your Raspberry Pi. Then on emulator choose page, you can press “Start”->QUIT->RESTART EMULATIONSTAION, press “A” to confirm. Then restart emulator, you can find the game added. use them for other usage. To get more latest information about Geekworm, please follow us on Facebook , Pinterest, Instagram , Youtube.